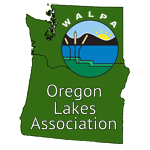 This year the Washington State Lake Protection Association (WALPA) will host its annual conference together with the Oregon Lakes Association (OLA) in Vancouver, Washington. The conference is scheduled for October 16-18 at the Vancouver Hilton. This year’s theme of Collaborative Lake Management will cover topics that appeal to a wide variety of lake managers, scientists, public agencies and citizen lake associations. Read on for tentative session topics. As an M.S. 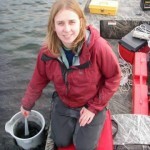 student at Western Washington University, I had the great opportunity to conduct my graduate research in one of Washington’s most scenic areas — the high-elevation lake environment of the North Cascades. The way ecological systems function in these extreme settings is intriguing. With prolonged snow and ice cover, low nutrient supplies, and rapid seasonal transitions from snow and ice cover to intense sun exposure, high-elevation mountain lakes must be inhabited by organisms well-adapted to cope under these conditions. 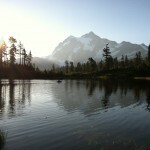 Due to the remote and extreme physical setting of these lakes, however, studying them can be logistically difficult. Consequently, much less is usually known about these systems relative to their low-elevation counterparts. Hoping to address chronic water quality problems in urban Hicklin Lake south of Seattle, a team of local residents, state and county agencies, and lake experts has come together to install floating wetland treatment systems (“floating islands”) on the lake. Floating wetland treatment systems are engineered, vegetated rafts made of natural or inert materials that mimic floating bog mats. The root systems of the island dangle into the water, taking up both nutrients and pollutants, and provide a substrate for extensive biofilms that also work to improve water quality. Some islands are passive, while others include aerators to increase water movement across the roots and biofilm. 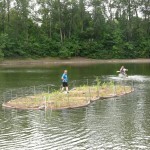 Floating islands are also used to create habitat for nesting birds and to shade water to reduce summer temperatures. The WALPA Board of Directors is pleased to announce its slate of candidates for the 2013 Board elections. Elections are held at each year’s conference in the fall; the current election will fill positions to be vacated at the October 2013 WALPA Conference in Vancouver (see related article). WALPA seeks a Board of Directors that balances regions and backgrounds including individuals representing agencies, consultants, educators and lake residents. If you are interested in running for office in 2014, please contact any member of the Board of Directors during the coming Board year. The WALPA Board consists of the President-elect, President, Past-president, Secretary, Treasurer, ten Directors, and an alternate Director. The sediment on the bottom of a lake exerts an important influence on water quality and aquatic life. For example, sediment may function as a sink and/or a source for nutrients, heavy metals, and other pollutants, and it is home to benthic organisms. 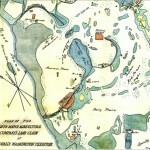 In addition, lake sediments are an archive of lake history and can record changes in climate, water quality, or land use within the drainage basin.